Your friendly neighborhood admin is back again with another Windows tool to help you tame your computer. I shared with you my favorite application for tweaking the Windows Registry (safely) with WinSecret How Not to Accidentally Mess Up the Windows Registry How Not to Accidentally Mess Up the Windows Registry Working with the Windows registry? Take note of these tips, and you'll be much less likely to do lasting damage to your PC. Read More and how to use SteadyState to keep your machine the way you like it even after letting others mess around on it. Now how about we look into what your machine does when it starts up? AutoRuns a SysInternals tool that has been converted into a Microsoft Windows utility is a much more powerful alternative to Microsoft’s built-in MSConfig tool (seen below). Both of these tools shows you what starts up with Windows and allows you to change it. AutoRuns just has a lot more options to help you out than its Microsoft predecessor. We all know that when our Windows machine starts up it loads a bunch of programs so you can use them throughout your session. But did you know as more programs are loaded into your system’s memory the slower your machine is going to become? Some stuff is necessary but others are not. Services, applications and all sorts of crap can be starting up and using your resources even though they are never used. There are tons of Windows services and third party applications that decide to force Windows into starting them before your system is fully up. This leads to slow start up times and seeing your system drag its feet like it had a few shots. Why shouldn’t we be in control of what our machine starts up and when? Of course we should! It is our computer after all! You could go to your start menu and click run and type MSCONFIG… But if you are not into computers and their inner workings this window can be confusing to you. There is no breakdown of what an application or service does as you can see below. You are just given raw data and the option to enable/disable each item or all of them in a clip. The check box means it is enabled and as you can see above Autoruns shows you the name and location of each image. For start up files it always shows you the full path to the executable; for Registry entries you get the exact key location. 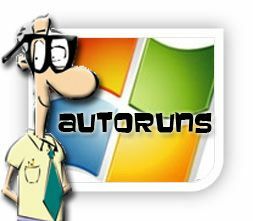 Autoruns also populates the name of the software publisher and whatever brief description it has stored. Double-clicking on any of these entries takes you to the appropriate place to check it out. A file will take you to its directory or a Registry key will take you to ‘regedit’ with the appropriate key opened. Your right-click options opens a context menu with more choices including the ability to search Google, get a digital signature or launch Process Explorer (separate download). That digital signature option is neat because it can hide all MS signed applications as well as verify that any third party executable is what it says it is. Logon includes the user and all users’ startup folders and the Run keys that are found in the Registry. Explorer includes a list of Explorer shell extensions, toolbars, and active setup executions. Internet Explorer includes Browser Helper Objects and Internet Explorer toolbars and extensions. LSA Providers includes Local Security Authority authentication, notification, and security packages. In Autoruns, you can permanently delete a startup item or just disable it. An online search option helps you find which items you can safely disable. This option runs an internet search for webpages that describe an item or its category and advises you whether to remove it from startup. When you disable an item, Autoruns moves it to a backup location in the Registry or on the hard drive. Some other awesome features are being able to compare one start up profile with another and identify discrepancies. You can export all your entries as a Text or CSV file for backup or troubleshooting. There is a WHOLE LOT of information contained withing this small 490KB application. I won’t go over the stuff you can do to shoot yourself in the foot like disabling drivers, services or even applications that your system needs to function so don’t just go messing around arbitrarily. This is a tool to help you get a better grip on controlling your Windows Machine… It is YOUR machine after all! Do you use a start-up manager? If so let us know in the comments! What do you stop/remove? with Nod32 it is general... i use it too and it takes too long to load everytime. My personal favorite which I use on the job is Codestuff Starter. It's a startup configurator and process stopper rolled into one. I am looking forward to checking out these new developments from MS, however, and I never met a Sysinternals tool I didn't like. I agree, all Sysinternal tools are pretty good. My fav. one is PageDefrag. WinPatrol is my choice as well. I'm really surprised that more folks don't use it. For my start-up manager, I use WinPatrol. It's absolutely fantastic and it tracks all changes in real-time so when a program tries to change something, you get a pop-up box on your screen asking you if you approve or not. Using WinPatrol, I have been able to tame all these stupid Apple and Adobe updaters. You mean it isn't just me who has a severe hatred for those updaters? My CS suite always wants to update at the worst time!